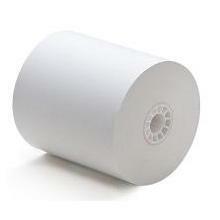 3" x 165ft Bond Receipt Paper Rolls are a common sized Bond Receipt Paper Rolls, often referred to as Register Tape. The 3 inch roll width and 3 inch roll diameter allows these 1-ply Bond Receipt Paper Rolls to fit in most POS Impact Receipt Printers that utilizes 3 inch wide Bond Receipt Paper. 3 inch by 165ft rolls are also used in many restaurant kitchen printers.